I arrive in New Julfa in a late July afternoon, with a scorching heat and such a strong light that almost makes disappear the few streets that make up the Armenian quarter of Isfahan. We are in the last days of Ramadan, and despite being a place with a strong Christian presence, all the cafes are closed. There is a good number in the neighbourhood: most of them are well-furnished, a bit larger than a room, and wrapped in a penumbra created specifically to protect the privacy of the young Christians and Muslims that – in the context of a closed and sometimes tough city like Isfahan – can find here some relief. In one of these cafes, a few hours before sunset, I shall have occasion to order something to drink, which is not so common in Iran in the month of Muslim fasting. No trace of Armenians today; only Persian is heard in the streets, among the few passers-by. I meet just one: the aged clerk of a supermarket where I enter to buy some water. At first glance, New Julfa immediately shows a distinct character compared to the rest of the urban fabric of Isfahan: an elegant residential neighborhood, which is also the shopping destination for the urban bourgeoisie. Among the many shops available, and some small shopping centers, I catch sight of a Benetton store. The streets seem very well kept, with wide paved walkways that make pleasant strolling. The impression, similar to the one I had in other Christian districts in the Middle East, is that of a widespread economic welfare: thus in Beirut, but also in pre-war Damascus and Aleppo. Making even more distinctive the quarter, and giving it somehow a European character, is the presence of some squares where young and old spend their time talking. Above all, surrounded by a beautiful colonnade, is the Julfa square: here is the Armenian supermarket Ararat, where you can also buy pork ham with the curious lettering “reserved to the religious minorities”. Strolling around, signs of other businesses reveal their Armenian property. I run into a coffee named after Ani, the ancient capital of western Armenia, a pastry called Akhtamar, as the island on Lake Van where is the site of a major cathedral, and a gym known as Masis, after the highest peak of the sacred Mount Ararat. Significant names that speak of the deep connection of these people with their homeland. Finally, what is arguably the most important treasure of this quarter: its thirteen seventeenth-century churches. The most famous, the Holy Savior Cathedral, which was announced in May as a forthcoming entry in the list of UNESCO World Heritage Sites, is a remarkable synthesis between Islamic, Armenian and European architecture. No less elegant and beautiful – and equally covered with sumptuous frescoes – is the nearby Church of St. Bethlehem, the only other open to visitors. Anyone who has seen the churches of the Caucasian Armenia will be taken by surprise here: the first ones are bare and essential, as the ones of Isfahan are rich and sophisticated, designed to abduct the eyes and hearts of those who enter, just like the contemporary mosques of the city. Underlying this process of acculturation is a history longer than four-centuries. Arrived in Isfahan in 1604 at the behest of Shah Abbas I, one of the greatest rulers in the history of Iran, the Armenians played a key role in the heyday of the Safavid Empire. Skilled traders, they were deported from the Ararat plain and the town of Julfa (in today’s Azerbaijan) to the capital Isfahan, with the double aim of using a scorched earth policy in a border disputed by the dreadful Ottoman neighbor and of giving a new impetus to the economic development of the capital. Allocated out of town, over the river banks of Zayanderud (the urban limit at he time, later engulfed by the city expansion), the Armenians enjoyed a great religious freedom and soon, after the tragedy of exile, also a considerable wealth. They named their new settlement New Julfa, in memory of the lost homeland, and were able in a few years – aided by the support of the Safavid crown – to create a network of businesses whose ramifications extended from Malaysia and India to Russia and Europe. The next day, I talk about the history of this neighbourhood with Artin Mouradian, director of the Diocesan Council of the Armenians in Isfahan. While I wait to be received, sitting in the waiting room of the offices behind the Cathedral, I observe significant comings and goings in the hallway. I cannot help but think: here are the Armenians! The impression is that in fact many of them lead a separate existence from the rest of the city, closed in their own spaces. I am surprised by the figures that Mouradian gives me: there are approximately 10,000 Armenians in Isfahan, and over 500 students in the Armenian schools of New Julfa. Numbers that sound even more remarkable if we consider that the Christians in Iran (not only Armenians) detected by the census of 2011 are only 117,704. With the pride of knowing to belong to an important history, Mouradian tells me of the many activities of his community, ranging from music (two choirs) to sport (as in other Iranian cities, there is an Armenian community centre) up to publishing (in New Julfa, in the seventeenth century, Armenians created the first typography of the country). With the centenary approaching, a mention of the Armenian Genocide could not be missing; and so Mouradian speaks to me of their commitment in order to reach even in Iran an official recognition of this tragedy. 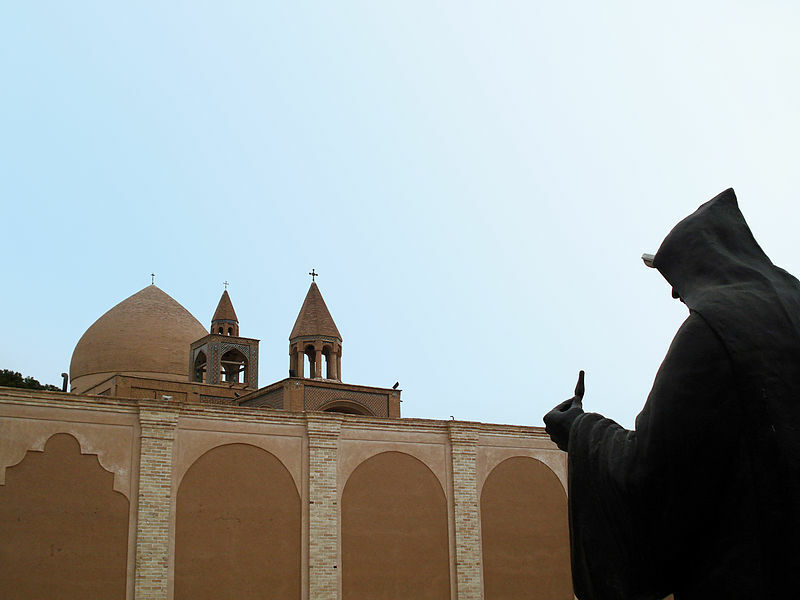 From a religious point of view, Isfahan is – along with Tehran, Tabriz and Urmia – one of the three dioceses of the Armenian Apostolic Church in Iran. Every Sunday the Mass is held in rotation in two of the thirteen churches, so to keep them all in operation. In New Julfa there is also a small Catholic and Protestant minority. In the context of a Middle East in flames, where some of the oldest Christian communities are in danger of disappearing along with their spiritual and material heritage, that of New Julfa is a reality that deserves to be preserved and known. As for Iran, those of Isfahan and Tehran are the only Armenian communities which have remained numerically relevant. Others, because of internal (toward the capital Tehran) and external migration (to the United States, in particular) seem doomed to rapid extinction.